Rybak Development closed on the $23 million purchase of a four-building assemblage at 331, 333, 335 and 337 East 82nd Street. 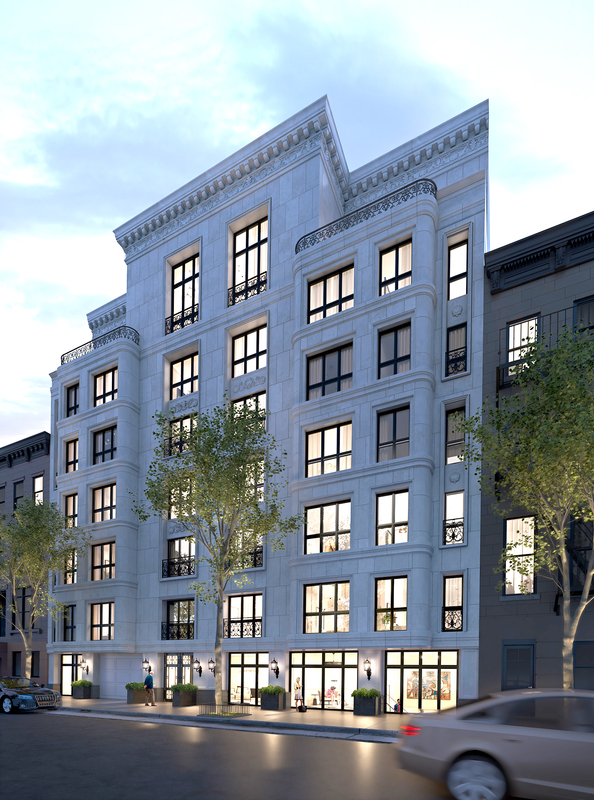 The Brooklyn-based construction and development firm announced it will building Manor82, a limestone clad 21-unit luxury condo with one-, two and three bedroom apartments, duplex townhouses with terraces and penthouse units with 18 ft. ceilings. The project has been filed to be composed on 35,875 FAR s/f. Shay Zach brokered the sale of the assemblage while with Epic Commercial Realty, representing both Rybak and seller, Sean Lavin. He said Rybak beat competition from Elad Group, Naftali and Izaki Group Investment to secure the site. After 14 years with Epic, Zach launched his own firm this month. Gaia Property Group will offer a full platform of services from asset evaluation, tax abatement consultation, market data analysis and real estate investment sales in the New York metropolitan area. CBRE was named the exclusive marketing and sales agent for three development sites in Queens and Brooklyn by owner Majestic Empire Holdings. The sites, located at 138-41 Jamaica Avenue in Jamaica, 505 Utica Avenue in East Flatbush and 219-44 Hillside Avenue in Queens Village, total nearly 70,000 s/f and offer and additional 137,700 s/f of building square footage. Zussman added that these neighborhoods experienced an unprecedented building boom in recent years, creating demand for new commercial space in those boroughs. Newmark Knight Frank announced the sale of The 9 at Parsippany, located at 9 Entin Road in Parsippany, New Jersey. Kevin Welsh, Brian Schulz, and Chuck Kohaut of NKF’s Tri-State Capital Markets Team represented an Institutional Investor and Lincoln Property Company on the transaction. The team was also responsible for procuring the buyer, American Equity Partners, a private real estate company based in Edison, New Jersey. The 9 at Parsippany is a 196,894 s/f office Building that is 72 percent leased to a mix of corporate headquarters and high credit-quality companies offering stable in-place cash flow with substantial upside through the lease-up of the 55,514 s/f of vacant space. “The Property’s durable in-place cash flow and significant upside were appealing to American Equity Partners. They are well positioned to benefit from the Route 10 Corridor’s ongoing transformation into a dynamic mixed-use environment that will continue to drive tenant demand,” said Kevin Welsh, executive managing director. Colliers International announced the auction of a vacant 200,000 s/f Class A New Jersey property. Formerly home to the corporate headquarters of Jaguar Land Rover, this two-building industrial/office asset is located at 555 MacArthur Boulevard. The Colliers New Jersey investment sales team is led by Jacklene Chesler and includes Patrick Norris and Matthew Brown. The team will be marketing the asset in conjunction with Ten-X.com. The auction is slated for February 25-27. Colliers is now conducting property tours by appointment. The location presents a warehousing and distribution asset for final mile delivery of goods with a warehouse building of 28-foot ceiling heights, nine loading docks and one drive-in. Also included on site is an additional 30,000-square-foot space that was previously used by Jaguar Land Rover to develop technological innovations. The space offers heavy power and two drive-ins and a loading door that can easily accommodate warehousing needs. The location was vacated earlier this year after Jaguar Land Rover moved its headquarters to a 350,000 s/f location also located in Mahwah. One Wall Partners, an owner and manager of transit-oriented workforce housing, has acquired Park Square Apartments, a 159-unit Class-A apartment complex with 6,000 S/F of ground-floor retail space in Rahway, New Jersey. Holliday Fenoglio Fowler brokered the $34.9 million sale on behalf of seller, Roseland Residential Trust. One Wall Partners purchased the property free and clear of existing debt. Located at 1 and 2 Park Square in downtown Rahway’s Arts District, Park Square Apartments features two adjacent four-story buildings connected by a shared courtyard. The buildings were completed in 2009 and 2011. Meridian Capital Group senior vice president Jacob Schmuckler negotiated acquisition financing which was provided by ConnectOne Bank. Roseland Residential Trust, a subsidiary of Mack-Cali, was represented exclusively by Jose Cruz, senior managing director at HFF, along with Michael Oliver, Kevin O’Hearn, Stephen Simonelli and Mark Mahasky. The Hill Medical Center, an 82,000 s/f medical office building within the downtown campus of SUNY Upstate University Hospital in Syracuse was sold for $18.9 million. Hill Medical Center was sold by Business Venture Associates Limited Partnership to a national private equity healthcare investor and the deal was arranged by Lisa Menin of Jacobson Properties and Leo Jones of Cushman & Wakefield/Pyramid Brokerage Company, who represented the seller. Hill Medical Center is 98.5 percent leased and is anchored by SUNY Upstate University Gastroenterology. Marcus & Millichap sold a single-story industrial building at 572-580 Richmond Terrace on Staten Island for $9,200,000 . Jakub Nowak represented the seller, a private investor and the bueyr in the all-cash deal. “In spite of the recent news about the New York Wheel being scrapped, Staten Island continues to grow and mature as an attractive commercial real estate market,” Nowak said. Located on the corner of Richmond Terrace and Franklin Avenue, 572-580 Richmond totals 39,800 s/f, not counting mezzanine offices. The site zoning allows for the development an additional 118,702 s/f. Holliday Fenoglio Fowler announced the sale and debt and equity financing for the Hyatt House Bridgewater, a 128-room, all-suite hotel in Bridgewater, New Jersey. The HFF team represented the institutional seller, and procured the buyer, Gulph Creek Hotels. HFF also repped the new owner to secure a seven-year, fixed-rate acquisition loan and source a joint venture equity partner. The hotel was marketed as part of a three-property Northeast hotel portfolio. The Hyatt House at 530 Route 22 East comprises one two-story building and five three-story buildings with one- and two-bedroom suites featuring kitchens, separate living space, bedrooms and work areas. Hotel amenities include a guest market, complimentary hot breakfast buffet, H Bar, business and fitness centers, outdoor swimming pool and hot tub, fire pit and patio and 1,500 s/f of meeting space. The HFF investment advisory team representing the seller consisted of senior managing director Daniel C. Peek, managing director Denny Meikleham, senior directors Alan Suzuki and KC Patel, director Matthew Enright and senior managing director Kevin O’Hearn. HFF’s debt placement team representing the borrower included directors Patrick Keefe and Matthew Pizzolato. Keefe also sourced a joint venture equity partner on behalf of the new owner. CGI Strategies has acquired Parkwood Apartments, a 78-unit multifamily community in the Los Feliz neighborhood of Los Angeles for $20.15 million. The three-story Parkwood Apartments is located at 4646 Los Feliz Boulevard on a nearly one-acre lot at the southeast corner of Los Feliz and N. Vermont Avenue. The property’s entire inventory of one-bedroom homes has not significantly been updated since it was built in 1973. CGI will immediately begin to modernize the building’s infrastructure and common areas as well as renovate units as they become vacant. “The property benefits from its location at the cusp of Los Feliz and Silver Lake, unique neighborhoods that have emerged as two of Los Angeles’ most exciting hot spots,” said CGI founder and CEO Gidi Cohen. “In addition to the neighborhood’s exciting social infrastructure, the property is in within walking distance to the Vermont/Sunset Metrorail station providing residents with easy access to jobs and entertainment options in Hollywood, Koreatown, and Downtown Los Angeles. The acquisition was leveraged with financing from Bank Leumi arranged by Dekel Capital led by firm principal Shlomi Ronen. Tony Azzi, executive managing director of Investments with Marcus & Millichap represented both parties in the transaction.